The Jungle Junction Wheel Around Fun Set features all three of the show's main characters... Ellyvan, Bungo and Zooter! This playmat is the perfect way for kids to have fun with their favourite Jungle Junction characters and friends. 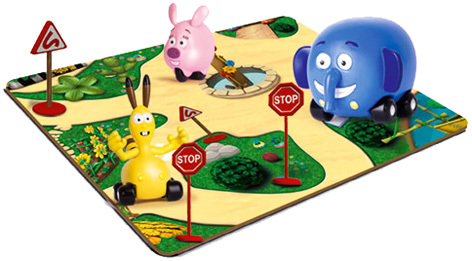 These freewheeling toys appeal to all young fans of this Disney series - and with a road playmat and two signs completing the set, kids are guaranteed hours of fun playing with some of their favourite TV show stars. Kids will probably also love the larger Jungle Junction Playset which comes come complete with a track and lots of working features. Please tell us what you think of the Wheel Around Fun Set by Jungle Junction and Flair.